At least 11 different species of cetaceans have been reported in the Gulf, but whether they use the Gulf as a temporary territory through their annual migratory routes or they reside here is totally unknown. Although the taxonomy for many species is still unresolved at a worldwide level, there are indications that this region may host subspecific populations for several species. 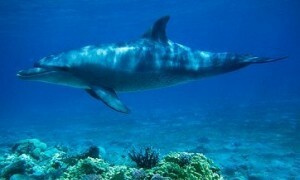 The Indo-Pacific Bottlenose dolphin is listed as “data deficient” in the IUCN Red List. Local populations show high differentiation to the extent that recently a new species has been identified (Moller et al. 2008). Virtually any local population could be a matter of concern from a conservation perspective. In fact populations that show high differentiation, tend to be more isolated and have a lower migration rate from neighboring areas. Therefore they are more vulnerable to local extinction. It is probably the most recognisable of all dolphin species, with its steel grey skin tone, triangular dorsal fin and long rostrum is found along the coastline of Dubai and Abu Dhabi. It differs from the common bottlenose dolphin (Tursiops truncatus) showing smaller size, longer rostrum and ventral spotting. However the Tursiops observed in the Gulf sometime lacks some of these characteristics leaving the question open as to whether they represent a different subspecies or if both species occur. 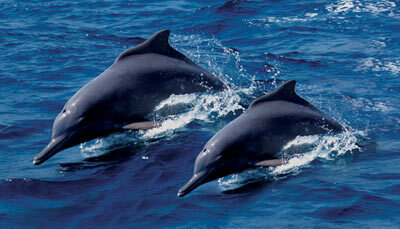 Bottlenose dolphins can be found in small groups of few individuals but also in big groups up to 40 individuals. They often approach boats and dhows. The Indo-Pacific Humpback dolphin (Sousa chinensis) is listed as “near threatened” in the IUCN Red List. 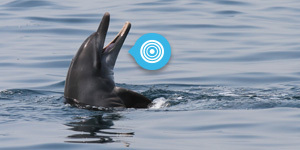 Recent studies show a very similar behavior to the Indo-Pacific bottlenose dolphin in terms of population structure, raising concern for the conservation of local populations (Mendez et al., 2011). Indo-Pacific humpback dolphins are notably recognised by their “hump back” in front of their dorsal fin, which in this region is prominent in mature animals. In the Gulf they are characterised by a uniform lead-grey body colour, in contrast to individuals found in other regions of the Indian Ocean where their colour can vary from pink to white and the hump is less pronounced. As for the Indo-Pacific bottlenose dolphin, it is unknown whether the Gulf population may represent a different subspecies. They are generally found in both sandy and rocky coastal waters from the Musandam Peninsula to Abu Dhabi and often seen bow-riding dhows or boats. 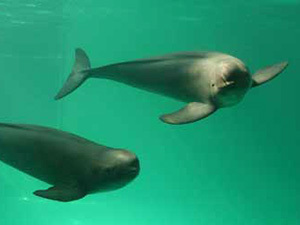 The Finless porpoise (Neophocaena phocaenoides) is listed as “vulnerable”. Very little information is available worldwide on this species and taxonomy is still an issue. 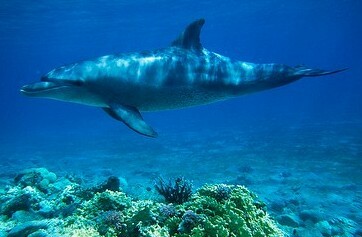 It is one of the most elusive dolphins and among the least studied cetaceans in the world, with a distribution ranging from China through to Thailand, India and the Arabian Gulf. 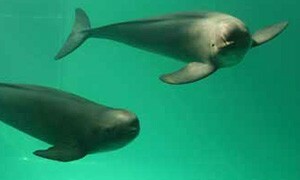 Finless porpoises are notoriously difficult to identify due to the lack of a prominent dorsal fin and their small size. In the Gulf they are a uniform dark grey colour. They are coastal species that favour sandy and marsh areas and can be found in very shallow waters. These elusive animals have only been recorded a handful of times in this region and usually confirmed through strandings. Being coastal, this species has been critically impacted by human activity and habitat destruction.